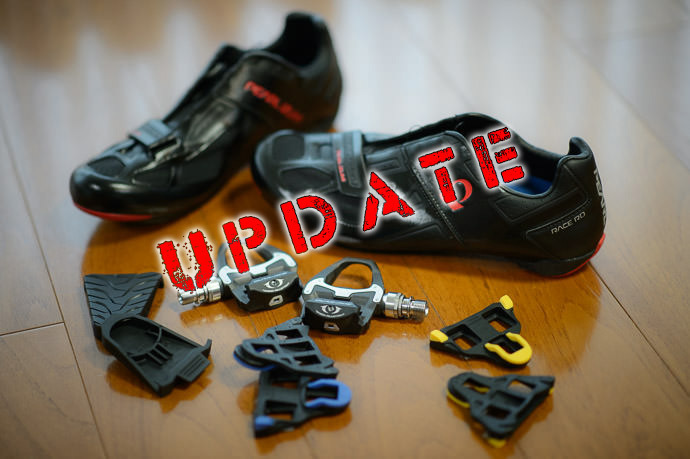 It's been a couple of weeks since I posted “Trepidation and Anticipation: Moving Up to Cycling Shoes”, which opens with the same photo seen above, and in which I admit my anxiety of riding with shoes that physically clip to the bike's pedals. The fear arose from not being able to put my food down in an emergency, thereby causing me to fall over, perhaps on nasty rocks or at high speed, or, even worse, in front of friends. Prior to this change, since I first got bitten by the cycling bug in January, I'd ridden 2,978km (1,850 mi) with normal shoes, which is roughly the straight-line distance from San Francisco to Chicago, though with an accumulated 50,507m of elevation gain, what I've actually done has exceeded that hypothetical route by almost an order of magnitude. This is not very much compared to many cyclists around here, but it's a lot for someone like me and I'd grown comfortable with how I was doing things. 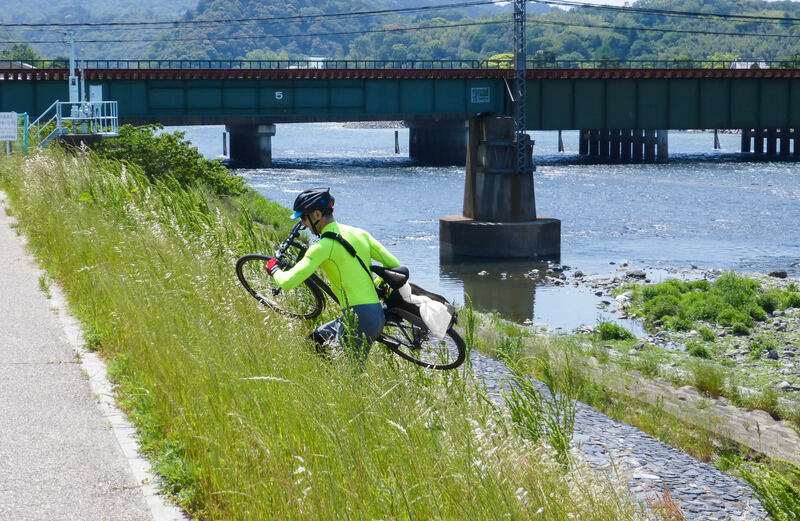 This is from a 60km outing to the mountains of Uji in May, one of the many days of exploration on the bike that I've not been able to write about yet. 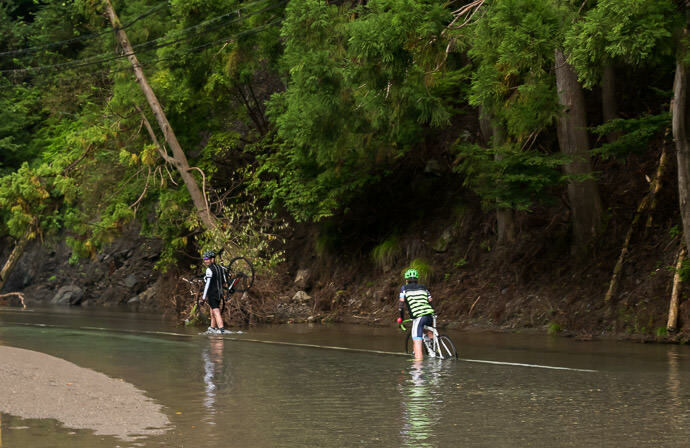 There are great benefits to wearing normal shoes when cycling, the greatest of which is the ability to immediately (and without thought or effort) move your feet from the pedals and place them on the ground, saving you from unceremoniously crashing over or into something. In the photo above I'm climbing up an embankment separating the dead-end path I'd mistakenly taken from the main road I should have been on. The steep climb on slippery grass was difficult enough with the ultra-grippy workout shoes I was wearing, so I can imagine it would have been extremely challenging with hard-soled cycling shoes with smooth-plastic soles suffering from a big cleat-wart on the front. On the other hand, such an attempt would have certainly been humorous fun for those watching. Later on the same trip, while riding a mountain trail, we stopped at an observation deck, while walking around I didn't have to hobble around. Road-bike cycling shoes are meant for riding the bike, not walking around. The cleat bolted onto the bottom of the sole under the ball of the foot makes for an awkward hobble at best. It was no problem for me with my sports shoes, but others had to pick and choose their steps much more carefully. So, given the advantage to normal shoes, why would anyone physically clip oneself to the bike pedals? The reason that I heard most often from those that did it (which is pretty much everyone else that I ever road with) is that it made them feel safer and more efficient. The “safer” comes from not having to worry about slipping off the pedals, and that does sound appealing. 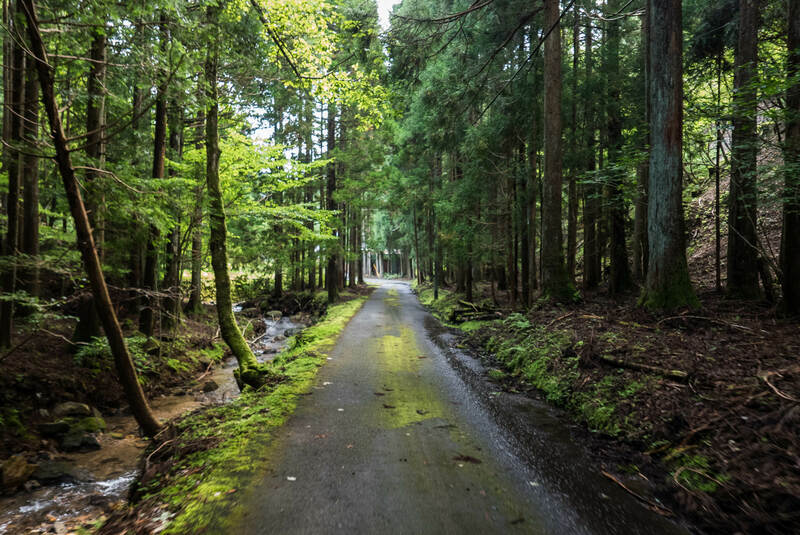 I'm not quite sure how or why it happens, but when going up very steep sections of road, I'd have one foot slip off on average perhaps one time a day. At best this was jarring, but sometimes could be painful as my shin hits the pedal or delicate parts slam into the bike. In any case, I intended to give them a try, and as I wrote I was quite nervous at the idea. I gave them a short little try, and came up with “Gave The Cycling Shoes a Try; Wasn’t So Bad”. Two weeks have passed, and I've ridden a total of 523km with them. The first long mountain ride with them, reported on in “Clipped In: Baptism By Fire, But Feeling Well Satisfied”, helped me get over a certain part of the fear, including some of the fear of falling over if I can't unclip quickly enough. Because I did fall over once for exactly that reason, and didn't get hurt to badly, I realized that it wasn't necessarily the end of the world. 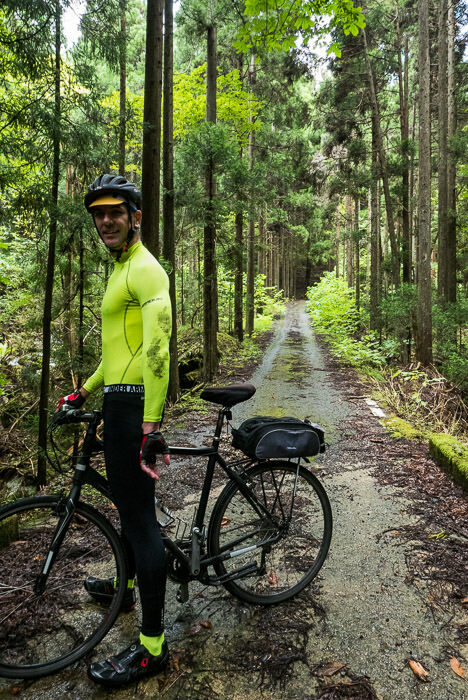 Perhaps my biggest steps forward came a couple of days later with this 83km (52mi) mountain ride with Manseki. 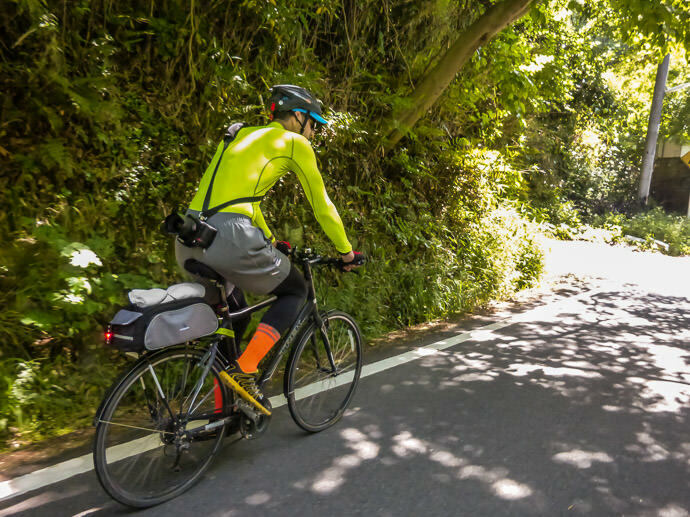 We'd originally planned to do a simple, light ride just to get our mojo back after having been away from the bike while having our respective summer vacations, but we ended up doing so much more. First I learned that you don't actually have to keep both feet clipped in all the time. We'd met for the ride here in town at Kyoto's Nijo Castle, which involved some slow riding through crowds on sidewalks, and I was scared to death of having to suddenly stop my already-slow progress because of someone making a sudden change of direction, but Manseki told me he always keeps one foot unclipped in such situations. This was an enormous relief, and made things much easier. 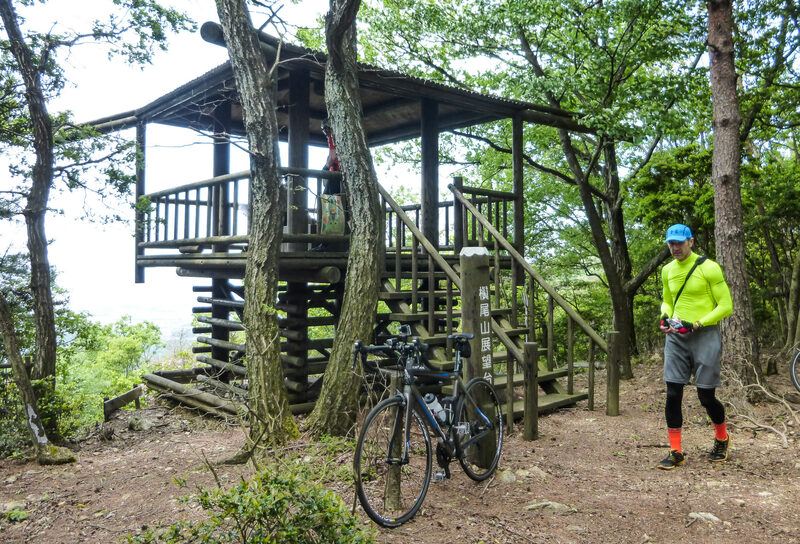 For our ride, we decided to man up and climb over Hanase Pass (花背峠) to have coffee at Cowbell, a ride I've done before described here. 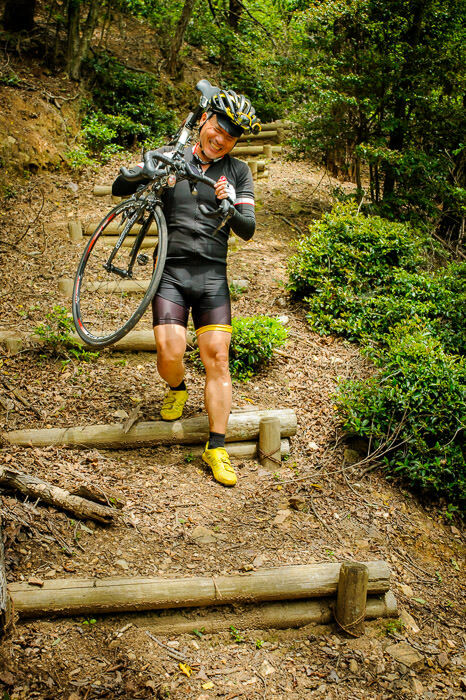 I have a love/fear of the climb to Hanase Pass, 5.6km (3.5mi) of unrelenting steepness that has no flat or downhill parts. I've done it many times but I still feel slightly ill right before each attempt, simply at the prospect of subjecting myself to the climb. But I made it without stopping or falling over, and that certainly gave me extra confidence. 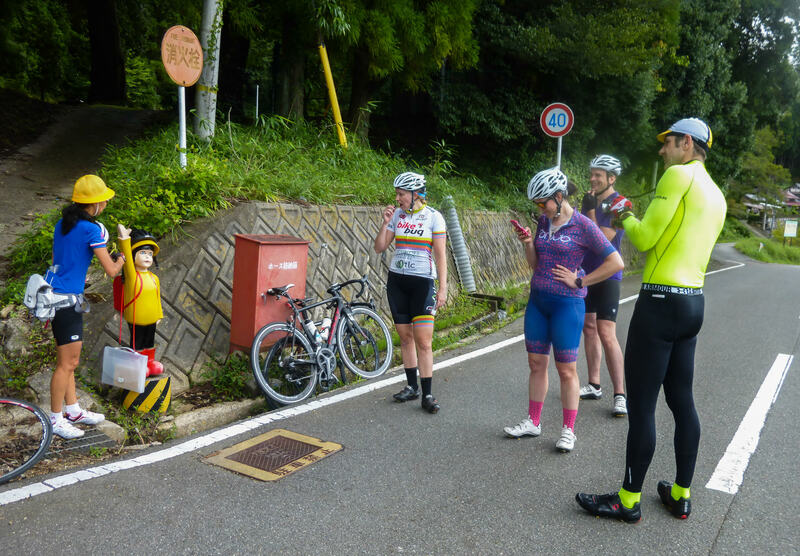 After coffee, we decided to try the climb to Momoi Pass (百井峠), and again, my level of trepidation spiked. The distance of this climb is short — just 1.2km (0.75 mi) — but the average slope is over 11% and the average for the main 600m of it is over 15%. 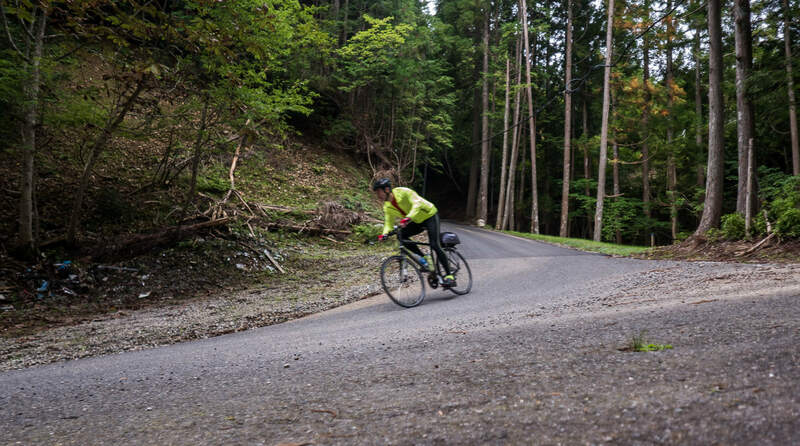 In fact, the only other time I'd even attempted this soul-crushing hill, I ended up walking the whole way to accompany a friend who was new to riding clipped in and fell over, right in front of me, at the steepness at the start of the climb. This instilled a lot of fear in me, both of riding clipped in, and of that particular climb. So, buoyed by my success at Hanase Pass, I decided to confront my feat of Momoi Pass head on. It was much more brutal that I remember from walking up it some months prior, so much so that I quickly decided to abandon my policy of not using my smallest (of three) front chain rings. A real road bike, when I get one, won't have such an easy gear, so I've been trying to do all my rides without. But this attempt was way too much and I wasn't sure that I could do it even with the easy mountain-bike gearing. Thoughts of falling over onto the horribly-potholed road filled my mind as I decided to downshift to my bike's easiest gear. In trying to downshift on the slow, steep climb, the chain popped off and I came to an immediate halt. This was exactly one of my main fears of riding clipped in. No forward movement means that you fall over immediately, and this is what happened... except somehow — I have no idea how — in that split second the frantic spasms of my foot freed itself from the clip and I could put my foot down, avoiding the fall that my mind had already decided was a foregone conclusion. I put the chain back on and continued on up without further incident. Surviving the chain incident, and making it to the top of Momoi Pass, did wonders for my confidence. That day's ride, which I hope to eventually write about separately, then took us through some wonderful countryside that was new to both of us. At times I forgot that I was riding clipped in, and the sudden re-realization of it would bring a shot of adrenalin and minor fear. I'd been told many times that the biggest chance of falling was when idly coming to a stop and not unclipping because you simply forgot you were clipped in. I could now see how this was entirely possible. There's a real chance of the entire wheel slipping when applying power up these steep grades, so being able to complete this without falling over, despite the occasional slip, also added confidence. The return climb up the other side of the same pass is even steeper, and is even more mossy (similar to the photo above, which is of a flat section elsewhere on the road). Confidence goes up again. No longer did I get a shot of adrenaline when I suddenly remembered that I was clipped in. I often found myself chatting at stops without any conscious memory of having unclipped. This told me that I was now comfortable with the shoes in “normal” situations. This was great, meaning that I had passed through the “slowly roll to a stop and fall over because you forgot to unclip” danger stage, which for me turns out to have been just one ride. 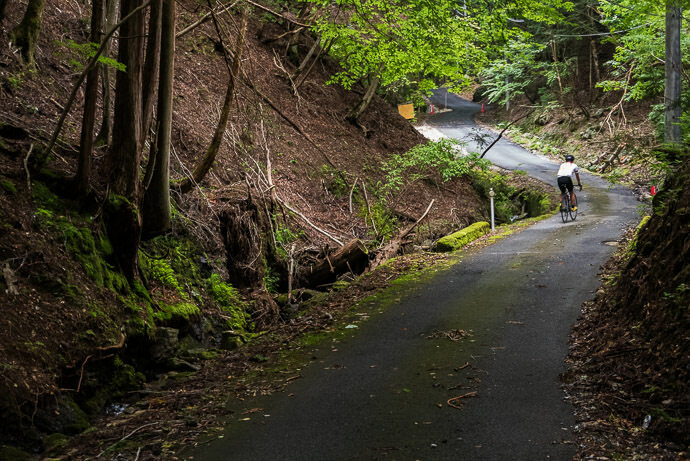 I've written about this hill in “Kyoto’s Nasty 21% City-Bike Hill Climb”. 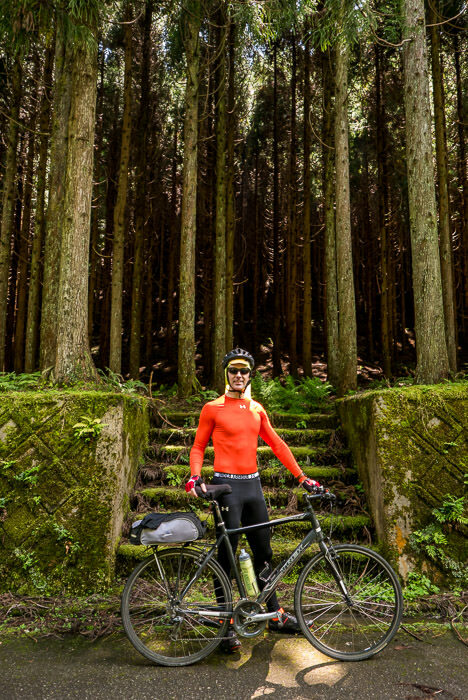 I can do this climb nonstop in my bike's easiest mountain-bike gearing, though it's a different matter to be able to do it and have to do it. I was hesitant (frankly, scared), but I switched to the easiest gear and gave it a try while clipped in. It turned out to be no problem. In the past I've been able to do this with 28F 23R gearing (1:1.22 ratio), so in theory I should be able to do it while clipped in on the new bike I've ordered, whose easiest gearing is 36F 32R (an easier 1:1.13 ratio), but I'm sure that the stress and fear of being clipped in will play a part, perhaps for the better or perhaps for the worse. We'll see. My next ride was the next day, again with the two visiting Aussies. 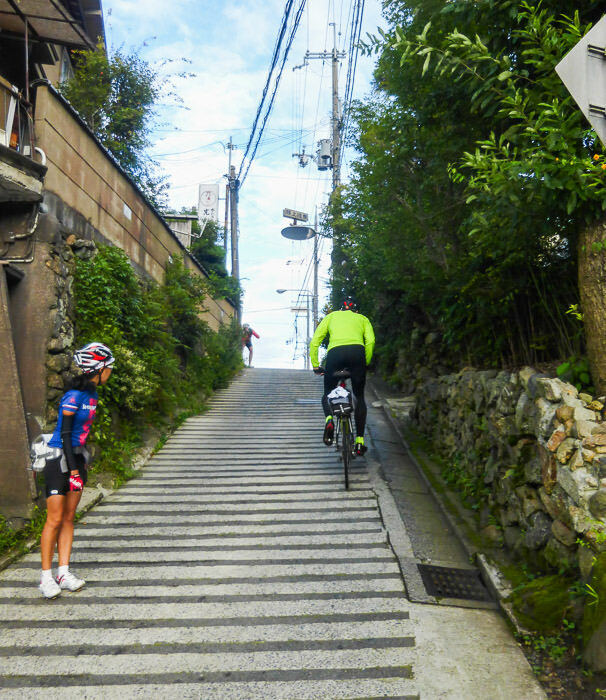 It turnd out to be mostly a repeat of the ride a few days ago with Manseki where we did Hanase and Momoi Passes. This time up the feared Momoi Pass, I made sure to get into my lowest gear early on, so I didn't have any chains popping or falling over, and I could do it nonstop. It remains to be seen whether I could do it on a road bike with normal gearing. Among our group that day, I think Bridget was the only one who could. The next ride was an easy 108km round trip to Osaka. There are no hills, so nothing to challenge my remaining fears. Finally, my most recent ride was the most awesomely epic awesome bit of epicness seen in “Epic Cycling Adventure with Andy and Nigel”. The original plan was less ambitious overall, but did include what for me was a scary challenge: to try again the eastern climb to Maegahata Pass (前ヶ畑峠), the main brutal part of the climb seen in July's “My First Ascent of The Most-Heinous Momoi Pass East”. It includes some truly heinously steep sections, and is long. I worried that I simply wouldn't have the power and endurance to do the whole thing in a road-bike gear, but I wanted to try. I needed to try. If I couldn't do it, I'd rather fall with my current bike than with the new one. I took it slowly but surely, and made it. I was slower than last time, but in a more difficult gear and clipped in, so I'm satisfied. From there we decided to head north, and ended up on an epic journey. I had a chain pop off again (and again somehow didn't fall), a flat tire (my second ever), and a lot of fun. I've still got the fear of super-steep roads in a road-bike gear, but maybe a few attempts (and perhaps a few fall) will cure me of that. In any case, that aside, I'm pretty comfortable with the shoes. I'm also happy to find that I can still use the special pedals (Shimano Dura-Ace) with normal shoes, such as when I used the bike to pop over to church for Mass. That's a nice bonus. I have a pair of hybrid shoes, the cleats are recessed, making them much easier to walk on. And, yeah, it doesn’t take much time for unclipping to become second nature. 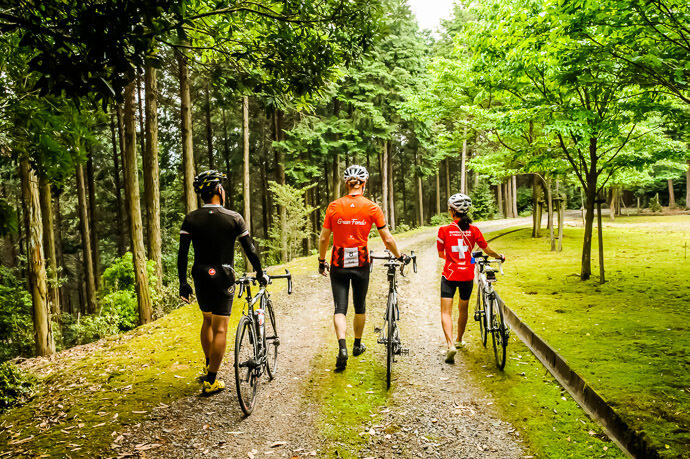 Gearing: Kyoto is obviously a mountainous area so there are a few options that you can do when you get your “real” road bike. 1) Just get a triple like you have now. In Portland, OR, a lot of the road bikes sold there are triples and that’s what I have. 2) Compact crank: Smaller front rings give you the gears to get over the hills, but you may “spin out” on the descents. If you are not racing, that may not matter. 3) New rear cassette. Most new bikes come with a 11-25 or 12-25 rear cassette. Going to a 12-28 or something with more teeth in the back will give you you some better low range. Shoes: Why not get a pair of MTB shoes and use those on days when you know you will be doing a bit of hiking and keep the road shoes/pedals for the pavement? Just takes a few seconds to spin on new pedals. 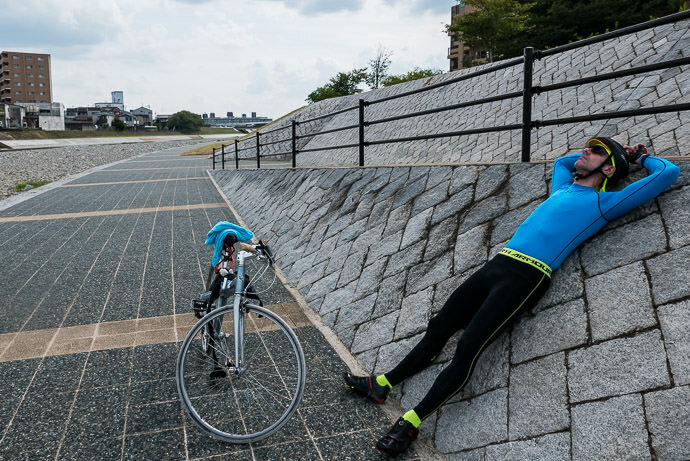 Pretty much everyone I know – including me – fell over exactly once on their first clipped-in ride. After that, it was no problem. Also, I moved from a 3-chain ring to 2 about three years ago. I simply had the shop install a different rear gear set which lowered the ratios slightly. It limits my top speed a bit, but I actually don’t want to go any faster. I never missed the 3 ring. If you do this, make sure that you have the chain length adjusted as well.